In August 1943, the United States sent my grandfather Pierre Boucheron to Casablanca as the liaison between American forces and the Free French Navy. While in Morocco, he wrote several short nonfiction pieces in French and English. A village with his name existed, he was told. He hired a driver and went to see it. Here is my translation of his “Visit,” originally written in French, which includes a document he copied while on his trip. On Sunday, February 20, 1944, I finally visited my namesake village somewhere in North Africa. It’s a place so small, lost in the immensity of the desert, that it appears only on local maps and military plans. For months, I wanted to visit this place, for reasons more sentimental than otherwise, but obstacles kept falling in my way. First, it was necessary to obtain official permission, a task which could not be done in less than several hours. In fact, it took half a day. Then, once permission was granted, the winter days were too short to make the round trip before dark, even though my Arab driver had discovered a shortcut by which, he assured me, we could save twenty-five kilometers. It was absolutely necessary to travel by broad daylight through the bled, the rough back-country. Lastly, there was the question of lunch. Some weeks ago, I attempted to make this ramble. Lunch at the Panier Fleuri, an inn situated halfway, turned into a meal too long and thoroughly wetted to permit our continuing on the uncertain tracks. This time, however, we left early in the morning with no notion of where we would eat. In a pinch, we could sample the local hostelry, if the village had one. We missed a meal, as it turned out, but this time we saw Boucheron. It was with the strangest emotions that I traversed the last leg of the journey, along a route nationale which was mediocre enough. Every few kilometers my name appeared on little blocks of stone by the side of the road. From time to time, a great concrete signpost at a crossroads announced the name of a distant locality, generally an Arabic name, as well as our destination. Thus I read my name in letters thirty centimeters tall over an arrow pointing straight ahead. This would hardly matter if I were a Durand or a Dupont, something utterly common. But the name Boucheron turns out to be rare even in France. In the United States, it belongs to none but my immediate family. On several occasions, people have sworn to me that there are Boucherons in New Orleans or Montreal. When I tried to verify these claims, they would invariably deflate to a Bourgeron or Boucher or something approaching it, but never an authentic Boucheron. So, as I say, I experienced a lively satisfaction in seeing my name repeated so many times along the road. At last, we arrived at the village, or rather hamlet. It had a population of 123 inhabitants, Arabs for the most part, with seven Jews and four Europeans. At the center of the public square, next to a small garden full of flowers, stood a monument dedicated to the memory of Lieutenant Bramaud du Boucheron. He fell on the field of honor on March 29, 1908. He was killed while at the head of a detachment of Spahis, native troops, against the Berbers, during a program of general pacification carried out by France. The monument was a simple column of the white stone of the country, with inscriptions of the high deeds of the lieutenant and their date. A group of Arabs gathered around me as I took photographs of the monument. They demanded cigarettes and small gifts. I noticed a European face among the crowd. In French, I asked him for information about the village. Apart from the population figures mentioned, he said that the one and only inn, bearing the pompous name of Hôtel de France and occupying one side of the square, was closed for lack of guests, provisions and means of transport. The sole means of transport to the nearest town was the coach parked permanently in front of the hotel, its wheels up on jacks, without tires, a tarp covering the motor. It was a melancholy reminder of more prosperous times, rich in tires and gasoline, before the current war. I asked if there was not another café or boarding house nearby. He directed me to the bistro of Madame Laforge. All I could obtain there was some bad wine at five francs a glass. She had no coffee, no bread, absolutely nothing to eat, the hour for meals having passed, she said. I settled for a glass of wine, unquestionably le vin du pays, and stepped back outside. The town hall, here called Administration Civile No. 14, was next door, so I ventured in to look at the posters and public notices. I left my visiting card with the servant, who was astonished to behold Monsieur Boucheron in flesh and bone, and I promised to return. As one glass of bad wine was hardly enough to sustain me, I went back for another. Madame Laforge divided her time between serving her customers and giving the breast to a nursing child. An old man sat with two ex-soldiers of middle age, each wearing campaign decorations on the lapel of his jacket. Certainly, I thought, they must be veterans of the First World War who came here as colonists many years ago. The old man introduced himself as Sergeant Cornice. What a windfall for me to find this first-hand source! I called for a round of drinks and gazed at the old sergeant, who seemed to recover some of his lost vigor. He spoke rapidly in Arabic to one of the half-naked children who pressed around us. Their elders still lounged in the square, perhaps expecting another traveler. The boy ran as if the devil were after him. “He will fetch a document which might be of interest to you,” Cornice explained. While we awaited its arrival, he recounted with tears in his eyes the heroic exploits of his chief thirty-six years ago, and how he buried the remains in the neighborhood. Did my family name once begin with the particle “du”? Was this lieutenant a cousin of my father? Was it conceivable that my father, who died about 1898, was the naval officer in New Caledonia? I wondered over these interesting facts. The boy returned with a yellowed paper, carefully folded and tied with a tricolor ribbon. He presented it like a sacred relic, which in fact it was. With scarred fingers, Cornice slowly untied the ribbon. The paper bore the lovely script that all French schoolchildren are taught. “This is my official report on the death of my commanding officer, written the day after the event,” Cornice said. Toward noon, we moved a few hundred meters to the south of the shrine of Sidi Bou Accila. Spread about as skirmishers, we were fighting on foot against some groups of horsemen galloping 1,200 meters from us in the direction of the M Quarto. We fought here for more than two hours, and gradually the Moroccans became more and more numerous. They moved especially to our right, where they counted on the shelter of a ravine to attack and outflank us. Monsieur du Boucheron received the order to move to the right, to extend the line of riflemen by making a defensive detour to stop the movement of the enemy. As we arrived at the position of the last two platoons on a slight rise, these fell back before a good many Moroccan horsemen. Monsieur du Boucheron ordered us to dismount and fight on foot at the head of our horses. The enemy cavalry halted for a moment, but as they became more and more numerous, Monsieur du Boucheron ordered me to take half the platoon and quickly fall back 200 meters to fight on foot and support him as he retreated. When I arrived at the spot indicated, I took up position for combat on foot. Monsieur du Boucheron remounted to retreat. Just then, he saw a large group of Moroccan horsemen, who had slipped into the space left by the departure of the two platoons of riflemen, hurl themselves on a third, which was still fighting on foot on the plateau. At the head of the dozen men he had with him, Monsieur du Boucheron rode to the aid of the surrounded riflemen. Many of these were unhorsed or wounded. He had them taken on the croup by the Spahis and out of the conflict. His own horse was then killed. The Spahis offered him a horse, but he refused it. Corporal Bensenoussi tried to take him up behind, but his pack got in the way. He slipped over the horse’s croup and fell on the other side. He tried to run away on foot, defended by some Spahis who stayed around him. Up to this time, by a rapid fire, I had held back a number of horsemen who emerged from the ravine on the right. They threatened to completely surround the officer and the few men who remained at his side. When I saw Monsieur du Boucheron on the point of being surrounded by the Moroccans, I had my men mount their horses, and I rushed with them to his aid. As we came near, I asked him if he was wounded. He replied that he was not. I then had a horse brought up, but as the Spahi Sassi prepared to help him mount, this man was killed and the horseman beside him was mortally wounded. Then, while I was thrusting the bayonet with my men, Corporal Tarris and the Spahis Campana and Abdellouab brought the officer a horse they had taken in the conflict. As he was about to mount it, the saddle turned over. At the same time, Abdellouab’s horse was killed, and in falling he threw his comrades into disorder. At this moment, Monsieur du Boucheron was surrounded by the Moroccans. Three or four of them placed the barrels of their rifles to his back or chest and fired. He sank without uttering a cry. Only four men remained around me. Seeing that Monsieur du Boucheron was dead and that we were trying in vain to approach his corpse, I got out of the conflict and retreated to the squadron of African Rifles. We dismounted near the shrine. Our bullets compelled the Moroccans to retreat. A few minutes later, the infantry arrived and continued the battle. In this engagement, the conduct of most of the Spahis of the platoon was admirable. Two were killed while trying to mount the officer on a horse. Three were wounded, of which one mortally, in charging or in the conflict. Five had their horses killed from under them. Two corporals and many men fought as long as the officer was alive, and they did not retreat until I gave the order. We drank another round of that wretched wine to the memory of the valiant lieutenant. Made confident by the wine and conversation, one of the French veterans asked if I would take his daughter back with me to the city. She had been sitting for hours in a broken-down jitney a few hundred meters away, waiting for the local Arab mechanic to repair the carburetor, without result. She had to be in town that evening for a family affair. Marie Blanchard was a pretty and well-bred young person, eighteen years old. She was weighed down by parcels of produce from her father’s farm, destined for relatives in town, where rationing was strict. Her father insisted that I return the following Sunday to taste a real country feast of lamb, chicken, fresh butter, goat cheese, good wine, and so on. No such delicacies were to be had in Casablanca, and the farmer of those days was king. This year even the farmer stood to suffer if the rain did not come soon. It was the rainy season, and the rain was due, but the land was dying for lack of moisture. As we returned by car to the city, I saw that the herds were no more than skin and bone, foraging in almost barren pastures. Fields of wheat, barley and oats were well behind in their growth. The vines fared hardly better. As grain and wine are the basis of the people’s diet, a veritable catastrophe loomed in the near future if the harvest, already meager in recent years, were to fail. The village is known today as El Gara. 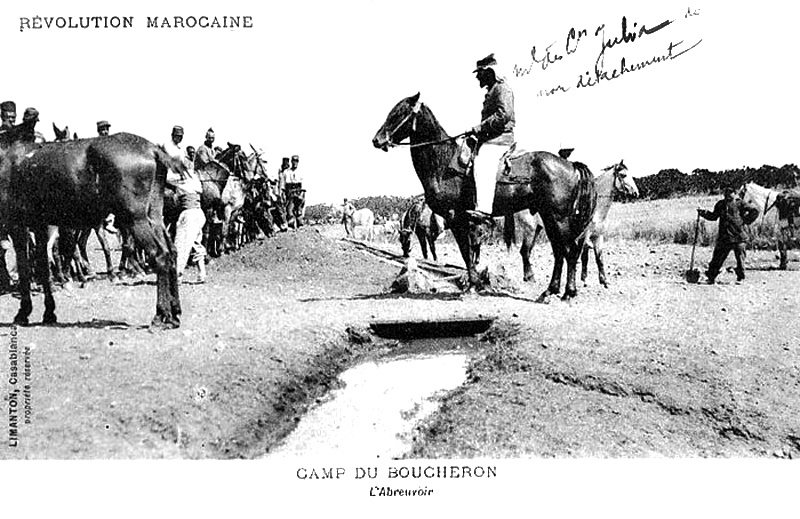 The website marocantan.com has picture postcards from the 1907-1908 conflict, also called the Mdakra war from the local tribes. On the map, El Gara is fifty kilometers southeast of Casablanca, or thirty miles. Even on bad roads, it could not have taken more than an hour or two to drive there. Captain Boucheron exaggerates the distance, and he may have embroidered other details. By virtue of his work in advertising, he was a skilled story-teller. With its understated humor, the piece sounds like a tall tale. Pierre Boucheron was the first advertising manager of the Radio Corporation of America under David Sarnoff in New York City, from 1920 to 1934. Born in Paris, France in 1889, at the age of ten he emigrated with his mother and younger brother Jean to the United States. He attended public school in Philadelphia, started work at age fourteen, learned Morse Code, and became an early radio operator, or “brass pounder” from the brass telegraph key, in New York and on ships in the Atlantic. In World War 1, he joined the United States Naval Reserve. From 1918 to 1938, he published articles on radio, sailing, sales, and travel in magazines such as Esquire, Radio News, The Rudder, and Scientific American. Early in World War 2, Pierre Boucheron led an expedition to Greenland, where he set up a radio station to protect Allied shipping in the North Atlantic. He wrote a book about this adventure. He then served in Casablanca, where he reached the rank of Captain, and in Paris after the Allied liberation in 1944. Before and after the war, he was the general sales manager and director of public relations for Farnsworth Television in Fort Wayne, Indiana. He then managed WGL Radio in Fort Wayne for several years. He died there in 1976. Robert Boucheron is an architect in Charlottesville, Virginia (boucheronarch.com). His stories, essays and book reviews are in Atticus Review, Construction, Cossack Review, Digital Americana, Milo Review, Montreal Review, Mouse Tales Press, New England Review, New Orleans Review, Niche, Poydras Review, Virginia Business, and other magazines. What a fascinating story. And think what it would mean to your grandfather to have his words in print in 2013!